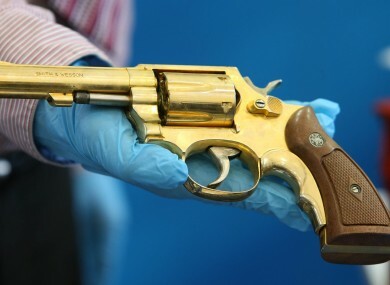 Golden revolver recovered by Gardaí during investigation into dissident. GARDAÍ HAVE DISPLAYED a quantity of guns, ammunition and explosives seized as part of recent investigations into dissident republican activity in the Dublin. The displayed weapons include handguns, shotguns, semi-automatic weapons, the explosive semtex and what appears to be a golden revolver. As part of ongoing investigations into dissident republican activity, Gardaí searched a number of containers in a yard at Cloghran, Co Dublin and discovered the weapons. A 46 year old man was arrested at the scene under the provisions of Section 30 Offences against the State Act 1939. Email “Dissident arms seizure includes golden gun”. Feedback on “Dissident arms seizure includes golden gun”.